Jimmylisa Badayos, also a human rights worker of Karapatan, emphasized that human rights defenders are individuals and advocates who rise to the challenge of changing the system, and are often victims of human rights violations themselves. “Naa mi diri tungod sa inhustisya na nahitabo sa amo. Dili mi musugot na mahitabo kini sa uban. (We [human rights defenders] are here because of the injustices we have seen and experienced. We struggle so that others will not have to experience what we have suffered through),” she said. Nanette Castillo, whose son was killed in 2017, echoed the sentiment of Badayos, stating that organizations like Karapatan are akin to first-responders, and have been helping victims for years. “Ang katotohanan ay ang Karapatan ay takbuhan ng mga taong inaabuso at mga naging biktima ng karahasan ng gobyerno. Sila ay kabilang sa mga tumutugon sa panawagan ng mga inaapi at mga biktima ng paglapastangan sa karapatang pantao. (The truth is that Karapatan is a comforting presence to the people who have gone through violations perpetrated by the government. They are among those who respond to the needs and calls of the marginalized and the abused),” Castillo added. 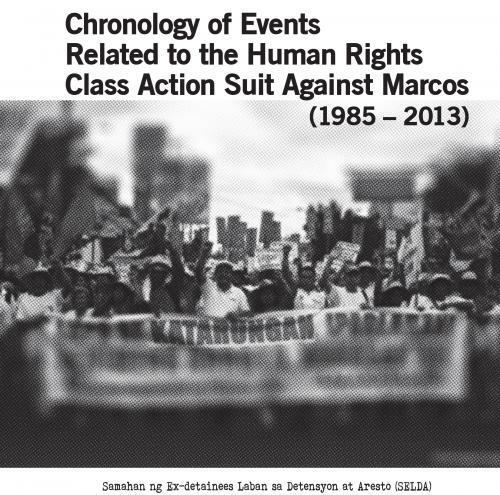 Badayos narrated that her entire family was subjected to various forms of human rights violations since 1990. “My father, Jimmy Badayos, was among the victims of enforced disappearances. This prompted my mother, Elisa Badayos, to become active in defending people’s rights, choosing to work alongside Karapatan and eventually became the organization’s regional coordinator in Visayas. My mother was killed in 2017, while heading a fact-finding mission in Negros Oriental, to expose the conditions and violations done against poor peasants. Prior to her killing, the government subjected my mother to a wide array of violations, including filing trumped-up murder charges against her. Even as the cases were dismissed, she continued to receive death threats,” she further said. “All she had until her last breath was her commitment to continue fighting. She crawled to escape the bullets directed towards her, but the perpetrators were determined to kill her. The fact-finding mission she led had a permit from the provincial government, and was done in coordination with the police. Yet, even after settling all the paperwork, even after asserting that fact-finding missions are a legitimate exercise of the people’s civil and political rights, they still continued to target her,” narrated Badayos in a statement. Castillo took the point further, strongly stating that the actions and policies of the government fit the description of what terrorism is. She also added that denying the realities on the ground adds to the gross injustice being done to the victims and their families. “Hindi ba ang gobyerno ang nasa likod ng malawakang pagpatay at pang-aabuso sa sarili nitong mga mamamayan? Ang aking anak ay mismong biktima ng berdugong estado ni Duterte. Ang kakapal ng mukha nilang sabihing walang patayang nagaganap. Sila ang dapat na bansagang terorista dahil ginagamit nila ang kanilang posisyon para abusuhin at patayin kaming mga mahihirap. Sila ay naka-uniporme at nakasuot ng magagarang damit, pero sa kaibuturan ay mga mamamatay-tao na walang pakialam sa batayang karapatan ng mga biktima nito. Nakakarimarim ang pagpapanggap at kasinungalingan ng gobyerno at mga tagapagtanggol nito. 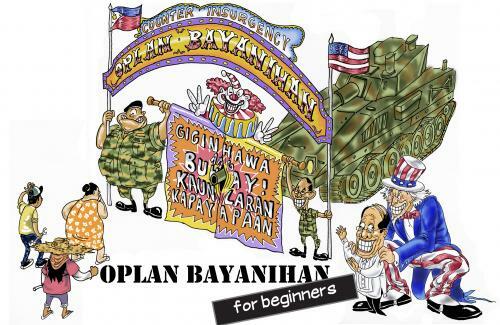 (Is it not the government who is behind the killings and abuses against its own citizens? My son was a victim of the Duterte government, and I consider them all thick-skinned for even denying the slaughter that continue to happen in our communities. They are the terrorists, using their position to abuse and kill the disadvantaged. They are in uniforms and dressed in formal wear, but their core is corrupt, evil, and without the slightest regard for human rights. The pretense and lies are truly disgusting and enraging to hear and watch),” she asserted. Badayos likewise reiterated that Karapatan and other human rights workers are not terrorists, but are dedicated individuals who seek to empower those around them to struggle, act, and fight for human rights and genuine social change. “My mother and human rights workers like her are not terrorists. I am here to continue the cause of my mother, withstanding the same repression and persecution that she withstood. We will not be silenced, even after all the red-tagging, threats, and imprisonment. If they kill us, many more will take our place. Who will defend the defenders? We are not afraid, for the people whom we stood alongside with, will likewise fight alongside us,” she concluded.